Kevin is the kind of guy that you can’t get to stop talking about his son. For him, skiing is as much about being out there with his son as it is about feeling the freedom of skiing for himself. 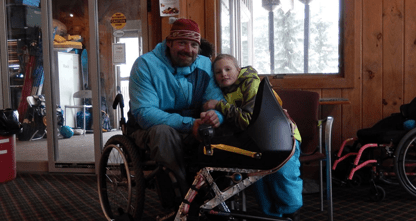 Kelly was able to ski with Kevin in January of 2015 as he was getting his new monoski fit. It was the first time in over 2 years, since before Kevin’s injury, that he had skied with his son. The two of them could not have been more excited to be out there! Check out below for some video of the two of them ripping together.